I’ve been obsessing over the possibilities of infect ever since I read Bennie Smith’s article that references a big Future Future League mystery. Excerpt follows. Bennie goes on to discuss his tries with B/G, mono-green, mono-black, and the lack of ability to “cross the finish line” for both pump-based and his own more resilient builds. Reading Tom’s quote, I had the same reaction Bennie did. What a great challenge! I brought it up with Elliot, who’d also seen the article but hadn’t dwelled on it long. He’d built a G/u infect deck that was undoubtedly clunky. He’d been using Gigantiform, which was awesome in certain circumstances but I was being adamant about not depending on “pump effect” spells, which in my opinion includes any cards like Gigantiform that, while not technically pump, have the same application: make your dude bigger to get more damage through. 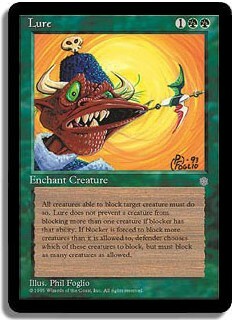 The next step was doing a Gatherer search to look through each green card from Zendikar block - all 104 of them. After compiling a list of interesting possibilities for non-pump super-secret infect-breaking spells, I compared it with Bennie’s. Canopy Cover was on both our lists and Elliot said that was pretty well-known so it seemed too obvious, like Gigantiform. Joraga Treespeaker was only on my list, as Bennie’s list seemed to assume the green spell in question was not a creature. Tom’s quote doesn’t actually rule out creatures, though one might assume since it’s an infect deck that it would, naturally, run poison creatures. The chance that it could be some kind of wacky approach to poison, like a Grafted Exoskeleton deck running fatty green tramplers powered by Ancient Stirrings (a card on both Bennie’s and my list), should be recognized, however unlikely. But for the time being, I put this thought at the back of the queue, promising to revisit it if my tries at the infect creature-based mono-green deck bombed out. Then I started working on making the deck bomb out. 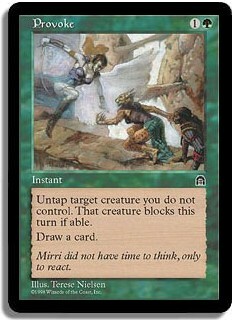 One of the major problems with death-by-poison is that generally, you absolutely have to make “physical contact” with the opponent in order to take advantage of the double strike effect of infect (the workaround to this is Livewire Lash, which is discussed in a later installment, or proliferate - which, while powerful, seems to encourage an even clunkier end product), and the best poison guys are a little more expensive, a little less powerful than the best regular guys. I felt like consistently getting the guys through was key to having a successful poison deck, to get to “crossing the finish line” as Bennie said. I decided that I thought the secret card was Irresistible Prey. In the games I’d played against Elliot’s deck, the big problem was that he really couldn’t get his guys through to do me any damage. I always had blockers. Irresistible Prey seemed more subtle than Gigantiform and like something that others might overlook. To complete the Lure/Provoke theme, I decided to run Prized Unicorn. “It’s Gideon Jura on a creature,” I told Elliot, which made it sound less embarrassing. We ran it against B/R Vampires and got killed the first game. The second game I misplayed my turn 3, dropping a Necropede looking to block instead of just swinging in to race with my Ichorclaw Myr. So we ran it back, and I hit with the myr and poisoned the vamps dead on turn 4 with a Primal Bellow and two Vines of Vastwood (so much for not depending on pump spells FTW). Then the baby woke up, and testing of this version was over. The results were kind of inconclusive since it was just two games and only against one deck. But I got enough feedback to see that not only was this build undependable, it could be really slow and was vulnerable to removal. Vines of Vastwood was great in mono-green, a cheap and effective poison pump. I never got to use Irresistible Prey and the Unicorn was so late to drop I was dead before she did her little trick. Of course, I only have 2 of each of those in the deck because that’s all we had in the basement, so maybe I would try it again with 4 each and some major tweaks. On the other hand, the deck showed so many shortcomings that I’m tempted to just skip ahead to a B/G discard-control poison strategy, a U/G control evasion-poison strategy, a white Tempered Steel/artifact creature poison strategy… or that wacky, mono-green Grafted Trampling Beasties poison strategy. This is great – it’s Friday, and I’ve got the whole weekend to develop two or three more infect “bombs”. Till next time, may Magic be your sword.